Vanton heavy-duty self-priming thermoplastic pumps are ideal for use on mobile acid buggies, for sump and tank evacuation and emergency overload pumping. They are often specified for in-line service where low headroom precludes the use of vertical pumps, and in other applications where rapid self-priming from depths to 15 ft (4.6 m) is required. Every wet end component is molded of homogeneous polypropylene (PP) or polyvinylidene fluoride (PVDF) — corrosion-resistant, abrasion-resistant thermoplastics that resist acids, caustics, salts, solvents, chlorides, halogens, and other aggressive, abrasive chemicals that can attack pumps made of stainless steel, high alloys, plastic linings, and fiberglass reinforced plastics. Even the stainless steel shaft is isolated from the fluid by a thick-sectioned thermoplastic sleeve. No metal components contact the fluid being handled, eliminating metallic corrosion and contamination. PRIME-GARD® pumps incorporate many of the unique design features of the Vanton CHEM-GARD® line of horizontal centrifugals. The retractable front bearing design allows quick, easy inspection of mechanical seals. The ability to adjust this bearing close to the impeller minimizes shaft deflection and impeller overhang, maximizing seal life. The expanded wide-open seal area accommodates most commercially available seals. With an integrally molded solid thermoplastic priming chamber and check valve, PRIME-GARD® self-priming pumps are not subject to siphoning and loss of prime when shut down. 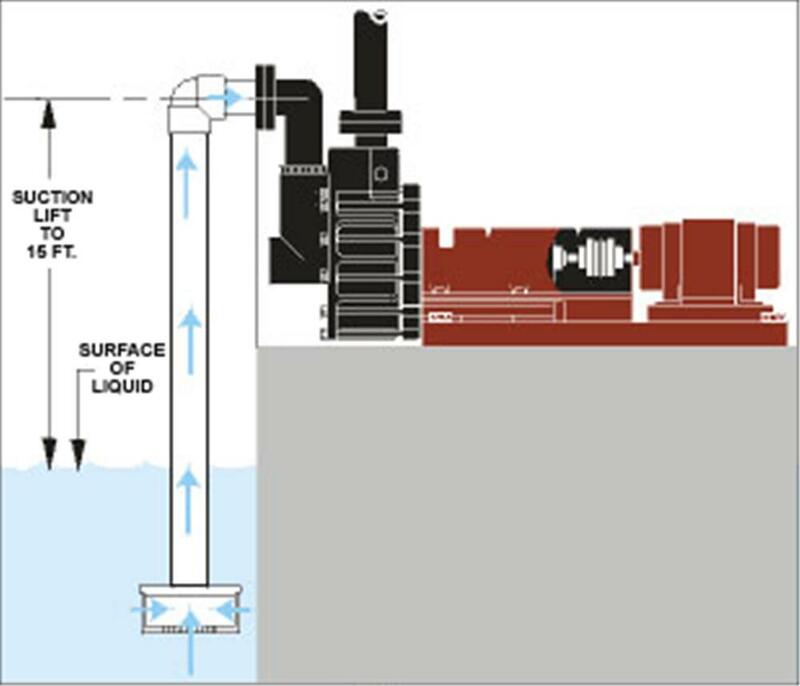 Once the pump has been primed, the liquid is trapped in this chamber and the pump remains primed unless it is drained for maintenance. Typical installation of Vanton PRIME-GARD®thermoplastic pump. 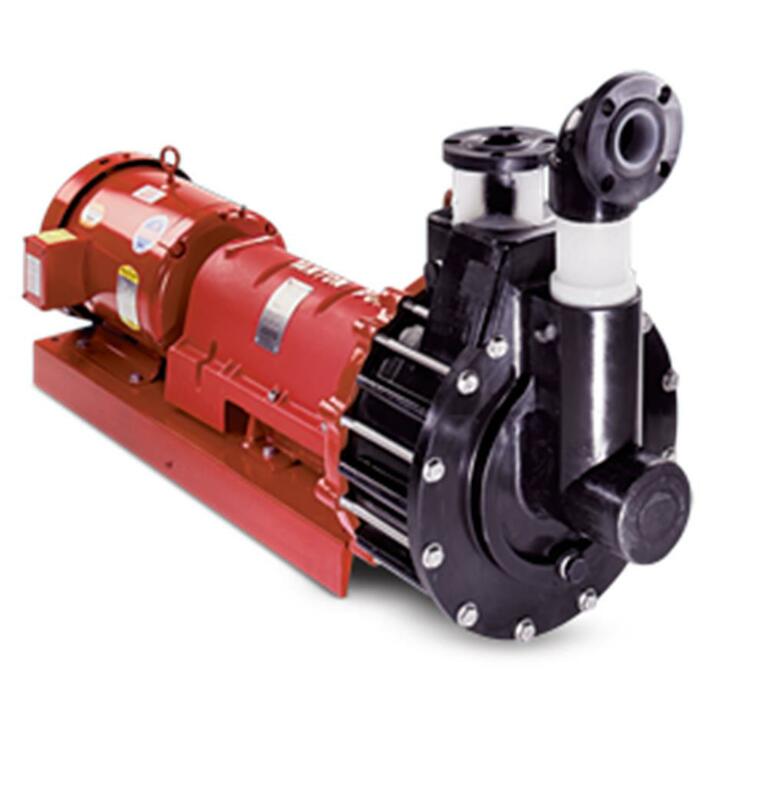 Unlike conventional designs, once these pumps have been primed, they stay primed, even upon shut down. Priming chamber molded from virgin, homogeneous thermoplastics incorporates an integrally molded, one-piece chamber, which includes an accessible check valve, inner casing and internal fluid passages, which holds prime upon shut down, unless drained for maintenance. Dynamically balanced, closed vane thermoplastic impellers with molded-in stainless steel inserts assure rigidity, and are key locked to the shaft. No bolted-on accessories or blind recesses to impede complete drainage. Interchangeable sliding bar pedestal which permits retrofitting with standard Vanton CHEM-GARD®pumps. Suction port designed to allow for rotation. Stainless steel heavy-duty shaft isolated from fluid by thick-sectioned thermoplastic sleeve.